A default field is the field from any table that is displayed in a related table or on the calendar view. If no default field is selected, Qrimp will use the first text field in your table as the default field. If there is no text field, Qrimp will use whichever field comes first. 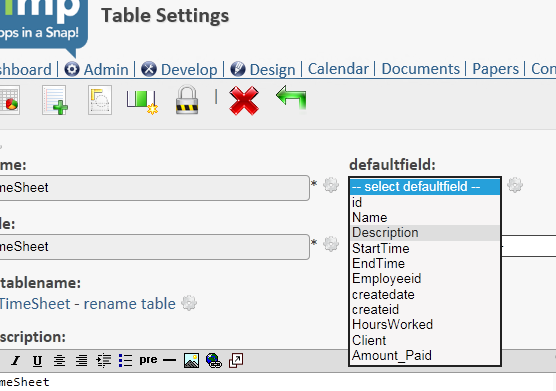 To change the default field, go to your table, then click the Table Management sub-menu. At the top of the table management page, click the link that says "Configure Table Settings". In the defaultfield drop-down, select the name of the field you want to appear. In this example, we will change the field from being the name of the timesheet to the description.